January 31, 2008 by Dave! I told you I’m not a food snob. Yes, I do love a really, really good meal–one that takes hours and involves many dishes, so you can relish the different flavors and enjoy the entire experience. But there’s more out there to experience than just posh places–there’s places like Dalessandro’s. There is nothing, and I mean nothing, pretentious about Dalessandros. It’s a corner joint, with a formica counter and the most uncomfortable chairs I’ve sat on in a while. But who cares? 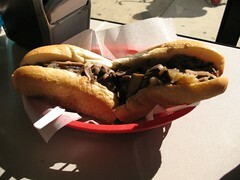 This place makes a killer Philly Cheesesteak. We went here on the recommendation of our friend who was getting married, she grew up in Philly. I knew I would love this place when I walked in. It smelled amazing. On the grill, just mounds of onions and mounds of meat. What more could you ask for? Grilled meat and cheese–two great tastes that go great together. The ‘steaks were awesome. Dripping with cheese (they mix it in with the meat) and with a tomato sauce that rules… and they have peppers on the counter so you can spice it up if you want–although you certainly don’t need to. I also had one with cheese and mushrooms that was great, too. (Yes, we went back multiple times.) If you’re ever in Philly, I’d take this neighborhood place that knows how to make a killer sandwich over any of the touristy cheesesteak shops you see around anyday. Last November (yes, November) my wife and I visited Philadelphia for a wedding. While there, I couldn’t resist visiting Morimoto. For those who may not know, Morimoto is Chef Masaharu Morimoto’s restaurant in Philly, which was his first in the United States. In addition to being an accomplished chef, Morimoto was also on Iron Chef, and even though he wasn’t my favorite Iron Chef (go Sakai!) he’s still pretty damn good. I had the pleasure of meeting Morimoto when he was here in Chicago at Fox & Obel for a book signing and tasting. At the Fox & Obel event, he made a daikon linguine which was pretty good (although most impressive were his knife skills, wow!!) and a tuna sashimi “pizza” that rocked. *1. 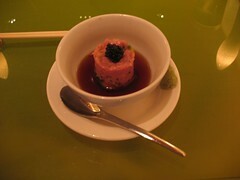 Toro tartare*, with shallots, caviar and fresh wasabi, in a dashi-shoyu-miran broth. Served with a mountain peach as a pallate cleanser. The tuna tartare was amazing. Simply amazing. The fresh wasabi was delicate and floral, with just a hint of heat–not the punch you get with Americanized green horseradish passed off for wasabi so often (although, I like that, too–it’s just different). The broth was a nice compliment, and the shallots, fried and crispy were the perfect texture offset to the delicate tenderness of the tuna. And I normally hate champagne, but I have to say this was an excellent pairing. Finally, the mountain peach–a tiny little ball of peachy goodness… it made me really, really want a good Japanese peach, which you just can’t get in the U.S.
Another hit. The oysters were amazingly fresh–in fact all the seafood was, which is why it was so delicious–and the “salsas” were very simple and complimentary. They tasted like the sea. It was fantastic. And the pairing hit the spot, too… a white that I really enjoyed! I think this was my favorite dish of the meal, if not, it’s a close tie. The scallops were just amazing, so fresh and delicious I am at a loss for words to describe them. I think I’d still eat this if I had a seafood allergy. Take a bite, EpiPen shot. Bite, EpiPen. Yes, it was that good. And once again, the pairing of the riesling was perfect. A wine I normally hate, that was just taken to another level with the delicate flavors of the scallops and the hot oil–which was not overpowering in the slightest. This was the dish. Can you go wrong with sashimi? Not when the fish is this fresh. Seriously. I wouldn’t say the dish was out of this world, or anything special, but when you have really fresh, high quality ingredients, it doesn’t need to be over the top to be amazing. Have you ever had honeydew sorbet? If not, have some! On to the hot dishes… the soba carbonara is my second/tied favorite dish of the meal. First, you have to understand that I love soba. If buckwheat isn’t your thing, this wouldn’t be the dish for you! The soba were perfect… cooked just right to noodlely perfection. Then you add those amazingly fresh scallops and the coup de grace–bacon–and how could this not be amazing? Then, the pairing was a soba ale–hearty and with a nicely developed buckwheat flavor that just complimented the dish so well–as good if not better than any of the wine pairings. I want this for lunch today! This was probably my least favorite dish of the meal… although, that is to say if you served it to me, I’d still be impressed. The problem is cod–I’m just not a cod fan. But I really did enjoy the sweet beans, and combined with the pepper they really did compliment the cod nicely. I just can’t get past cod. This was my favorite of the wines. I’d never had a Pinotage before, but I have to say, I like this grape. It was a deep red, and reminded me a lot of some American Zinfandels–not a wimpy wine. It’s not an expensive wine, either, but very tasty! Delicious sushi and a sippin’ sake! What can I say about the sushi? It was so fresh it was very good. And the sake was very nice, too. Sometime sake can just be too harsh to me and have more of a chemical taste. This was a smooth, smooth sake… no knocking back this stuff, it had to be sipped to be enjoyed. And did I mention that by this time in the meal, I was enjoying a serious buzz? A serious food high and more drinking that I’d done in ages. They were not stingy with the portions of drink. Another first. I’d never had a Madeira, but I enjoyed it a lot as well. The sweet potato cake was fantastic, of course. It was just sweet enough to satisfy the desert lust we were feeling, but not cloying or over-powering like some seven layer chocolate cake of doom. Very typical of the sweets/desserts I’d had in Japan, the sweetness was understated,but complimented by the sweetness of the Madeira. It was a perfect end to an amazing meal. So, there you have it. If you read this far, you must be hungry. If you are ever in Philly, I recommend stopping by Morimoto’s, and believe it or not, you can have an enjoyable _and_ affordable lunch if you don’t go all out like we did. Many of the dishes we sampled were on the lunch menu as ala carte entree. Don’t get the impression that I’m always this shi-shi with my dining. Next up: Dalessandros, the best “steak” I had in Philly. Well, I never really went away… but my posting frequency dropped off significantly. Last semester was crazy busy for me, with both work and school. So, even though I still had many things to say (I _always_ have many things to say) I never had the time to write them up and post. This semester is a little different. I’m still busy, but a little less so. Many of my work projects have wrapped up, and I’m only taking two classes. But it’s also my last semester, so I’ll be starting the job search (maybe), I have my note due for law review, and I got a fellowship which will take up some time as well. You know, sleep is for suckers. Anyway, I will be making some time to write on the old blog. I’ve tasted many cheeses, I want to write some about law school in hopes that something might be useful to other students or potential students, and just spout off in general.